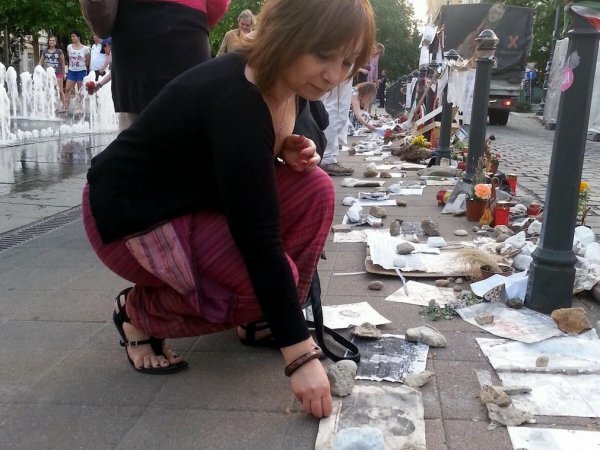 As a continuation of presentation of the work of the Living Memorial group in Budapest, Eszter Garai-Édler and Balázs Horváth provide insight behind more than two years of activism and almost four hundred public forum sessions. The interview was conducted by Katalin Szlukovényi. K.S. : What were your personal motives for joining the Living Memorial? Eszter: I got involved in various groups that stood up for universal human rights and fight for liberal democracy, against racism or anti-Semitism as early as 2009. Since then, a succession of governmental measures have made a mockery of the concept of the rule of law, which has convinced me that demonstrations are not enough any longer. Real change can only be achieved through fostering dialogue within our society. The memorial to the Nazi occupation erected in 2014 is one of the most striking examples of distorting history. I have felt that Living Memorial, founded as a protest against this lie of a statue, has offered a space for these dialogues to hopefully enhance solidarity. Balázs: For me, the key feature in Living Memorial was the novelty of its organizers’ approach addressing a highly sensitive and important social issue. It also gave me an opportunity to continue the cooperation with György Jovánovics and some other great artists I had first met during a former series of actions in defense of the freedom of contemporary arts by “Occupy LUMU”. Later, I realized that Living Memorial might also play an important role in bridging generations and calling attention to taking responsibility. So working for Living Memorial also makes me feel a bit like taking good care of my grandmother’s legacy. K.S. : What does a forum session look like? Balázs: We have based our sessions on models introduced by the Occupy movement. 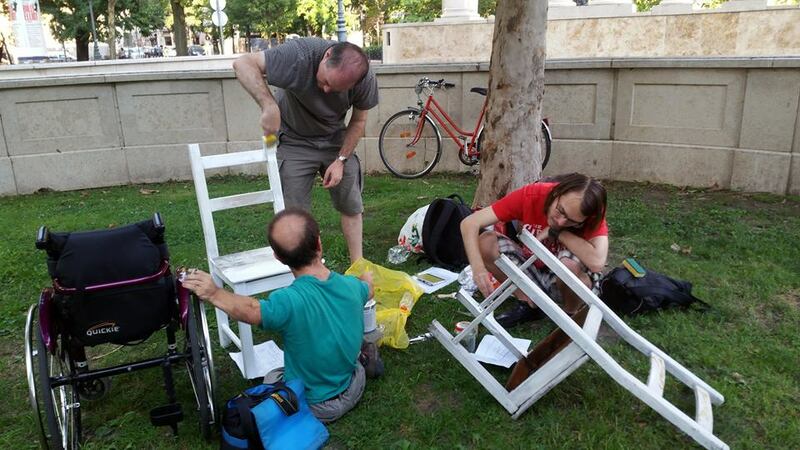 University student protesters in Spain, Hungary and all over Europe had developed certain techniques for moderating public discussions, and we adjusted these tools to our open forums held on roughly daily basis at the public space of Szabadság square. Our democratically moderated conversations give true reflection of the society we are working for, while allowing people who come from various social segments to get to know others’ argumentation strategies, and to reevaluate their own. It is encouraging to observe many individuals’ developments. Eszter: At the beginning of each session, we form a circle of white chairs awaiting anyone who feels like joining us. This image has become the emblem of our group cohesion. We use a simple electric audio system with microphones so that everyone sitting in the circle or stopping by can easily follow the discussion. Social media platforms help us reach a wider audience. Besides occasional mainstream reports on our activities, we also have constant, encouraging feedback in the form of citizen journalism. Both the challenge and the beauty of Living Memorial lies in creating situations that make very different, or often even opposing social groups meet and exchange their opinions. We have recognized the need for confrontation so we invite people from extremely diverse backgrounds, working out sophisticated ways of community thinking, which can ultimately bring together distant parts of a heterogeneous society. K.S. : What are the major themes of the discussions? Eszter: In the beginning our focus was on historical memory and social responsibility. Later we applied these perspectives to several other crucial contemporary topics in our society, like tolerance, non-authoritative communication, civil activism, non-violent resistance, the citizens’ responsibility for the community and the challenges of an open society. Each time, we invite a specialist on the given topic to give a short summary of the theme introducing the discussion. After the scandal at Szabadság square, there were further attempts at falsifying history, like the plan for a statue of Bálint Hóman – a Hungarian politician active before and during World War II and infamous for his support for anti-Jewish actions – in the town of Székesfehérvár. In cooperation with local activists, we successfully prevented the erection of that statue. So it seems that our discussions are also partly guided by current affairs. Above: Balázs Horváth, lead image: Eszter Garai-Édler. K.S. : What are the social intentions of Living Memorial? Balázs: One of our major goals is to expand civil participation by inviting new people to Szabadság square. We have been slowly but steadily growing due to our constant presence at that symbolic site – meeting more or less five times a week with somewhat changing participants – combined with a wide variety of programs. Péter Béndek, one of our founding members, articulated the pedagogical aim of Living Memorial as supporting people in finding out how they can best organize society for themselves through deliberate practices. Our discussions so far seem to confirm two substantial recognitions which present Hungarian society’s self-image in a new light. Firstly, our experiences testify that negotiation is possible between people who have been driven by political manipulation to consider themselves as enemies. Learning about each other might even change the former opponents’ entire attitudes. Secondly, we have proved that there are groups in every layer of Hungarian society who are ready to spend time and energy to understand complex social phenomena and, based on that knowledge, express their realistic political views and wills. K.S. : Who are the members or the audience of Living Memorial? Eszter: In the beginning the demonstration attracted primarily people arguing for or against the memorial – most of them against it. Therefore we started by reflecting on the traumas of the Holocaust, driven by our demand that society faces the country’s history properly and honestly. Many joined us because they felt personally involved in direct or indirect ways. However, the given political and historical situation has in the meantime made it necessary for us to broaden our perspective and to undertake the task of sensitizing people regarding several other social issues, offering the possibility for a great variety of people to join us. Now we can say that Living Memorial consists of assertive and responsible individuals who care for democracy and want to act for it. K.S. 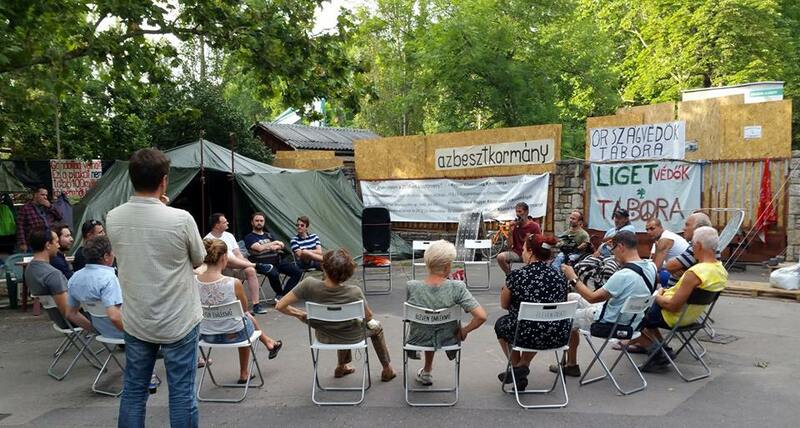 : Do you cooperate with any other activist groups in Hungary or abroad? Balázs: So far we have given workshops at the Polin Museum of the History of Polish Jews in Warsaw and in Barcelona on the occasion of a conference on memory. The support of contemporary artists has also proved to be crucial. 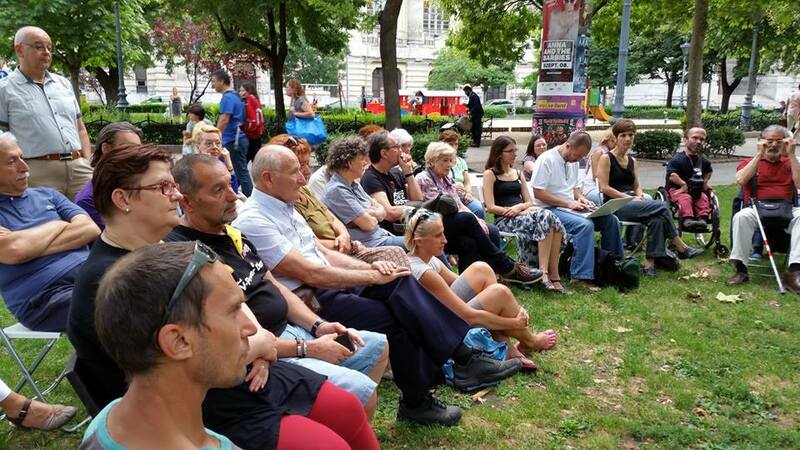 Additionally, we are connected to most of the significant activist groups in Hungary not only through trainings, where we meet, but also by inviting their key representatives. Many of our members are also active in different formations like the Anti-Poverty Network, the Rehab Critical Mass working for disabled people, Academic Network focusing on higher education, the umbrella organization Human Platform, health care workers organized by Mária Sándor, the local branch of Anonymous, Free Artists, “Heti Betevő”, who cook for the urban poor, or the green oriented Liget Protesters. Double memberships mean the most effective links, enhancing communication and cooperation between these originally distant centers of civil society. It is worth mentioning that there is another activist group present at the site called Stage of Freedom, somewhat ironically alluding to the contradiction between the name of the square – Szabadság means Freedom in Hungarian – and the memorial standing there, which has become a symbol of the illiberal government rhetoric and practice in Hungary. The coexistence of these two parallel formations implies both a challenge and a great opportunity for us to improve our abilities for collaboration, which is essential regarding the long-term goals of our movement. K.S. : What kind of a role does Judaism play in the current practice of Living Memorial? Eszter: I might say that Jews have as an intimate relationship with liberal democracy as the French do with wine. Tolerance, dialogue, sensible argumentation, personal freedom, cultural plurality and the intention to permanently improve society are essential features of humanity. Where one can sense a lack of these values, or a threat to them, one will also find some Jews around ready to protect them. Balázs: Jewish identity – including all its diversity – is an inevitable topic. Some say that many of the heated passions driving public discourse in Hungary are paraphrases of social conflicts rooted in the Socialist era or the period before and during World War II, never fully resolved. In the shadow of the memorial, being Jewish still means to be stigmatized as the enemy. It is important to note that Living Memorial is trying to break free from these outdated categories, like the narrative of the victim versus the perpetrator. Our members represent a multinational and multicultural Hungarian society which embraces its plurality of identities and rejects any kind of intolerance or discrimination. K.S. : What keeps you going after more than two years? What are your plans? Eszter: It is not enough to protest. Any kind of political change requires the systematic organization of discontented people and their rightful claims. It is a long term goal but we are on the right track. Balázs: Our strength derives from our mature yet still constantly improving community life. We are able to go on by getting new people involved in organizing further events at an outstanding speed, thus developing, teaching and spreading our community culture. Our next planned step is a several day-long workshop aimed at defining our strategy. Eszter Garai-Édler was born in the western Hungarian town of Győr, but has lived in Budapest since 1983. She works as a typographer at the Geographical Institute, Research Centre for Astronomy and Earth Sciences of the Hungarian Academy of Sciences. She is a civil rights activist who participated in organisation of several protests against racism and the Hungarian government. Balázs Horváth graduated as a Contemporary Theories of Arts and Curator major at the Hungarian University of Fine Arts, where he learnt the theoretical bases of critical thinking. 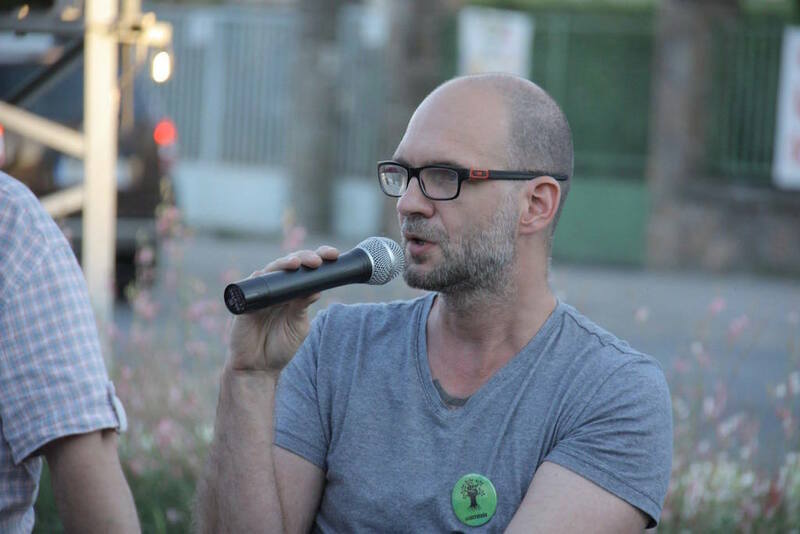 In the past couple of years he has been working as a full time community organizer supported by OSIFE (Open Society Initiative for Europe, https://www.opensocietyfoundations.org/about/programs/open-society-initiative-europe).